Well im back with another update on how my season is going, its been a while sine my last blog because there has a lot been happening in the middle part of the season. It started with moving house and changing team. I have now moved to the Limburg province of Belgium after being offered a place on a Wallon Continental team called Tpalm PCW, it’s a small continental team but it is a good opportunity to race at a higher level and gain some experience that will help me to become stronger and improve. I was also nominated for the South Ribble Council Lewis Balyckyi rising star award, unfortunately I didn’t win but it was an honour to be nominated. 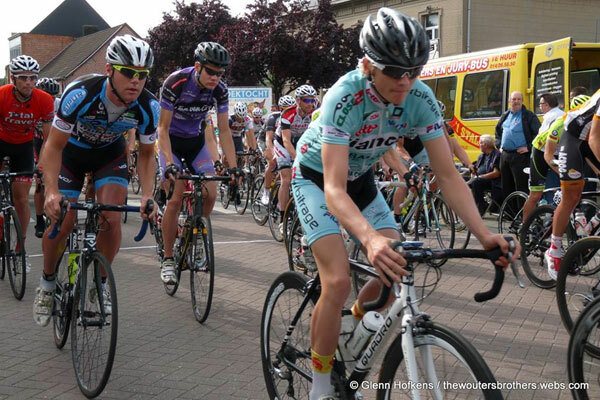 After my transfer and house move I started my first race with the team which was a UCI 1.1 race with the professionals called the Ronde van Limburg, talk about throwing myself in at the deep end! It was a great experience, it was a 210km race with lots of cobble sections. I managed to hang in the peleton (first main group on the road) until around 30 kilometres to the finish then I got dropped with a small group on one of the cobble sections. My new manager was pleased with my race as it was my first time with the pro’s. I was a little disappointed that I couldn’t make it to the finish with the leaders. After that I raced some small kermess races and managed 3 or 4 top 15 results after a bit of a chest infection I caught after limburg. Then I went onto the under 23 omloop het nuisblad with yet more cobblestones ‘YAY! !’ I am not best suited to the cobbled climbs as I am still only 56 kilograms so it would be another day of just following and that is what I did, I managed to get around in the 2nd peleton after it split into two. It was a great experience though and the first time I had ridden on the classics cobbles and I surprised myself with how strong I was, if I had ridden smarter I could have made the split I think. The next week was the start of the Tour of Liege which was a 5 day stage race with 140km-160km every day. The first 2 days where mainly flat with some small climbs, nothing serious and I got through fairly fresh. At the beginning of the tour I spoke with my coach and she said as it was my first 5 day race at this level I would do good just to make it through, so that made me determined to do more and not just follow and make it through – I wanted to race! On the 3rd day it was the day where it was supposed to get hard as we started the climbs and sure enough it was hard! In the beginning a large group rode off the front and I tried with a team mate to bridge across a few times with no luck, then there was a crash between the yellow jersey and a moto marshal and a fellow british rder Dan Mclay which neutralised the peleton until the jersey got back into the race, but doing this caused the break to gain a large advantage. After a lot of attacking and fast climbing I reached the finishing circuit in the 1st peleton but maybe the 4th group on the road and lost nearly 8 minutes on the leaders. Stage 4 was just as hard, after a very fast first hour trying to get into a breakaway the team of the yellow jersey decided to set a hard tempo on the front and all we could do was just follow the peleton. We came to the finish with no more than 70 riders after starting with around 130 and I managed to get to the finish without losing more time. The next day was the last day but by far the hardest with 11 climbs and a hill top finish after a fairly fast 4 days of racing in the legs already. 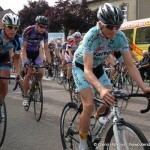 I managed to stay in the front group for the majority of the race and was fairly happy with how I was riding. I was climbing with the front guys all day right up until the fireworks started, and when the current under 23 world cyclo cross champion attacks you know its going to go hard. I got round to the finish in 50th place in a group with some respectable riders and finished 45th on GC, around 13 minutes behind the winner. It was one of the hardest races I have done in a long time. My coach and manager were more than happy with my result and my coach thinks I can go back next year and race for a good place on GC. The next race for me now is a 1.2 in France and I am feeling pretty good, so I am hoping if I am still there at the finish I can have a go at getting a good result. Again I would like to say a huge thank you to the LBTF for all their support, every time I pin a number on I feel a massive sense of pride and motivation because I am representing the fund and a good friend. 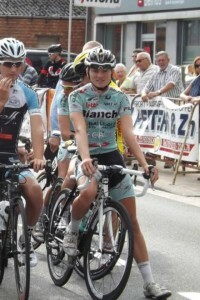 This entry was posted in Sponsored Riders, Thomas 2014 Rider on 29/07/2014 by Kevin Balyckyi. 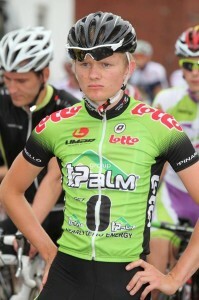 Tom is officially a Continental rider riding UCI 1:1 races with the pro’s. Well done Tom ! 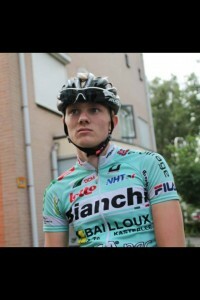 This entry was posted in Sponsored Riders, Thomas 2014 Rider on 16/06/2014 by Kevin Balyckyi. After what felt like a very short winter at home it was back to sunny Belgium for a bit of bike racing , but not before a last minute training camp in Spain for nine days with a friend from Belgium. Whilst away in Spain I was offered buy Bob (the man who supports me in Belgium and who I live with in his rider house) offered for me to go again to Spain with his well known Belgian junior team (DCM youth cycling team) just two days after arriving back from my first camp. So I jumped at the chance of another 10-12 days in Spain to train as it is perfect preparation for my first target of the season which is the under 23 Liege-Bastonge-Liege on the 19th of April. 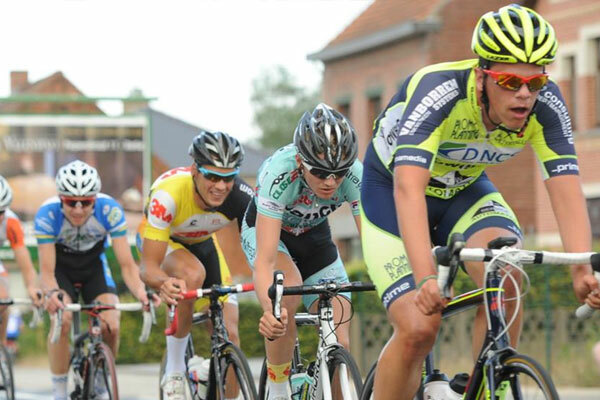 I Arrived back in Belgium a week before my first race for my team which was the GP Wilfred Peeters. It wasn’t a raced suited to me but it was a good race to get some speed in my legs before getting stuck into the season, it was 165km of nice fast flat roads and the rain showed up just in time for the start. The goal for the day was just to get round to the finish and maybe have a go If I felt good enough, I went with a couple of moves but nothing seemed to stick. Mid way through the race I had abit of a rough patch and got cold from being wet and it took me a while to warm back up and get back up to the front of the bunch. In the end I missed the break and just followed in he finished and moved up to the front for the sprint but unfortunately I pulled out my foot with 200 meters to go and came in 72nd place. Not a bad day but also not a good one but it is only the first race. After a week of some more training I travelled to Amay for a kermesse race which I was told should have abit of climbing and so it would suit me abit more. When we got there the climb was actually only 400-500 meters long not really a climb. I got through the races after trying to make the break away but missing the split and finished in the 3rd group on the road in 40th place not an amazing day but not a bad one. back to get some food and drink and missed the main move. I saw the break was going so went in the attack with 2 BMC development team riders but instead of riding with me they decided to attack me until one of them went across alone so again I finished in the man bunch. After a couple of days rest and maybe switching my brain on abit I moved to the next race which was the support race for the pro race called the schildeprijse. I rode this race last season and knew that either a group of 10- 15 riders will go away to the finish or it is a bunch sprint if the pace is too high. In the opening lap of the race a group got a small gap off the front of the 300 man bunch, I tried to bridge across to it with one other dutch rider but the bunch was chasing way to hard and even doing 60kph we couldn’t get across. I decided to keep my powder dry and wait until later in the race to see how the race unfolded, the gap started to come down in the last 15 km and at the point I knew it was to be a bunch sprint. I know I am fast if I can come off someone’s wheel, coming into the last kilometre I was sitting maybe 15th wheel and just kept moving up with 500 meters to go the sprint started so I just kept hidden and waited. With 150 meters to go I started to o for a gap to open up my sprint when the rider in front pulls his foot out of the pedal and cuts across my front wheel. That was my race over I went down hard and then the rst of the 300 riders went straight over the top of me. After a 6 hour trip to hospital just had to get some stitches n my elbow and some road rash scrubbed clean. Hopefully I will have abit more look in the coming races and first main goal for the season Liege Bastonge Liege (under23). My season this year started in March in Belgium this year supported by the LBTF fund and riding for the Bianchi, Lotto, NHT cycling team. I am living in a little village in Vorselaar near to the city of Antwerp. I arrived here on the 24th of February but I was ill with a chest infection so racing was postponed for a week or so which worked out well because there was a lot of snow at the time so races were being cancelled all over the place. I spent the first two weeks here training indoors pretty much every day it was negative temperatures and snowing on and off all the time. After two weeks my chest infection had gone and it was time to start racing, I found a race close by on a Monday an the weather had got a bit better over the weekend the snow had gone but it was still cold that afternoon I set off to the race and on the way there it started to snow a bit and the get heavier and heavier I signed on and got changed and as we went to line up in the middle of a full blown snow storm the police cancelled the race so we packed up and went home. Friday came and I had spoken with the team and the selected me to race at the U23 Hanzame classic I was extremely excited also worried my first race was going to be a big one I prepared properly and hoped just to finish. I was due to leave on the Thursday afternoon to a hotel near the start of the race so Thursday morning I had one last roller session before the race and whilst on the rollers another load of snow came down I was convinced the race was going to go ahead but when I got off the rollers I got a phone call explaining the race was cancelled. I planned to race again on Sunday but it was cancelled as well. Finally the Monday after I got to race it was a local race 10 miles away from the house I arrived at the race and there were 170 guys who started the race was very open and it was a super windy day it was 13 laps of a 7 km lap with the back half of the course very open with a strong cross wind. The first thing I noticed about the race was the speed it was so much faster than at home the first 3 laps I was in the 53 12 spinning it doing 65kph at some points it was a big shock to the system after a winter of no racing. I tried to go with a few moves and stay up near the front but then with 6 laps to go the race went into the gutter and I fought for 3 laps or so along with all the other riders then I blew and shot out of the back I was devastated, later I found out that there was only 37 finishers in that race out of 170 starters and everyone blew at a similar time so I kept my chin up and looked to the next race. The next race came and I travelled with the team I was comfortable the whole race and as the race started to split up I got myself towards the front of the bunch to try and get n one of the first splits. On one of the down hill sections with 2 laps to go I hit a big hole in the road and my rear tub went bang (it was flat instantly) I tried to ride and stay in the bunch because there was no service car but I could get one from the team near the finish but I couldn’t control it through the corners so I had to abandon the race. The next Monday I attempted to race again 3rd time lucky the course was short pan flat and very open with a lot of wind. At about half way through the race the bunch split in half I found myself in the second half but jumped across to the first half in the cross wind but as I was getting on we turned into a head wind and I just wasn’t strong enough so I finished the race in the second half bout 1 minute down again I was disappointed but I latter spoke with my coach and she told me there were some strong guys in the race that had also not been able to make the split so I felt a little better and on Wednesday she had found me a race that would suit me a bit better with lots of corners and no long windy stretches but I had a bit more bad luck there I was up the front all race I missed the break but one of my team mates got into it so I thought would have ago at the bunch sprint for 9th hoping to et a top 30 but with 2 km to go I got stuck behind a crash and rolled in 149th out of about 300 starters. Other than the bad luck and terrible weather in my first month I have enjoyed it very much, I have learnt a lot about racing hear and met some really nice people who are more than happy to help me where they can. Hopefully this next month will be easier as I get used to the speed of the races and distance of the bigger races, on Saturday I travel to the arden to do a hillier race and I also found out I made the team pre-selection for the under 23 liege-bastogne-liege so hopefully I will get picked to race there. This week I have also made it into the local paper after a short interview with a local photographer/reporter.I would also like to say a massive thank you to the Lewis Balyckyi Trust Fun for their support because without them I wouldn’t be here racing for the season.